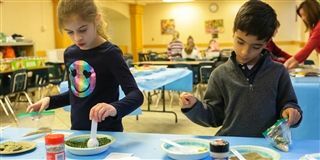 As part of the third-grade unit on hunger and poverty, students assembled 50 jars of dried bean soup to support those in need in Wilmington. Students will deliver the jars to Lutheran Community Services next week. The success of the Soup for Souls service project is one example of Tower Hill’s commitment to providing quality service-learning projects that support our greater community and various partnerships.